Ever since the official release of Windows 10 on July 29th, over 100 million PC users have upgraded their Windows 7/8.1 installations to Windows 10 using the free upgrade offer. If you upgraded from Windows 7/8.1 to Windows 10 or plan to do so in near future, you probably are aware that you need to upgrade your current Windows 7 or Windows 8.1 installation to Windows 10 in order to get the free upgrade and it’s not currently possible to activate Windows 10 using your Windows 7 or Windows 8.1 product key. Microsoft’s decision not to let users activate Windows 10 using genuine Windows 7/8.1 key has forced many users upgrade their Windows 7/8.1installation to Windows 10 even if they wanted to perform a clean install of Windows 10 from ISO. Although once the Windows 7/8.1 installation is successfully upgraded to Windows 10 and activated, it’s possible to easily reinstall Windows 10, many users are experiencing activation issues after the clean install. It looks like Microsoft has taken this activation issue as well feedback very seriously as Microsoft announced earlier last week that users will be able to activate their Windows 10 by using genuine Windows 7, Windows 8, Windows 8.1 product key. What this means is that millions of PC users who are yet to upgrade to Windows 10 or over hundred million users who already upgraded to Windows 10 will soon be able activate Windows 10 by entering their Windows 7, Windows 8 or Windows 8.1 product key. And before you jump with joy, please note that it’s not possible to activate the currently available Windows 10 build 10240 (RTM build) by entering Windows 7/8.1 product key. The feature has been incorporated in build 10565 which is currently being tested by Windows Insiders. 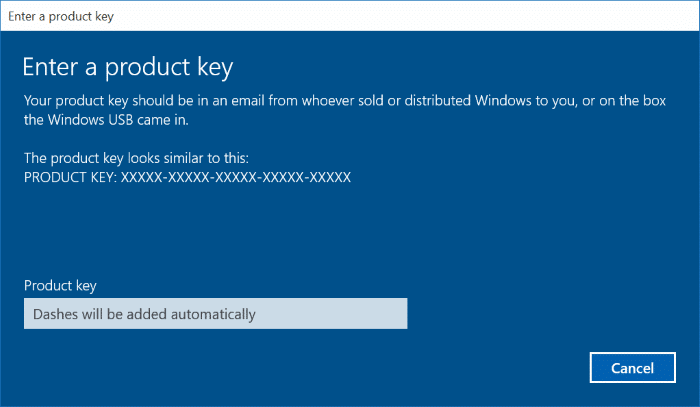 Nevertheless, in a few weeks from now, a new build of Windows 10 will be released to public and once it’s out, anyone can upgrade to Windows 10 and activate the copy using genuine Windows 7/8.1 product key. This method of activating Windows 10 using Windows 7/8.1 product key works only if you attempt to activate Windows 10 on a PC or device which was previously running a genuine copy of Windows 7, Windows 8 or Windows 8.1. That is, if you had running a legitimate copy of Windows 7/8/8.1 on your PC, you can use this method to activate Windows 10. Step 2: Click Update and security. Step 3: Click Activation. Click Change product key button. 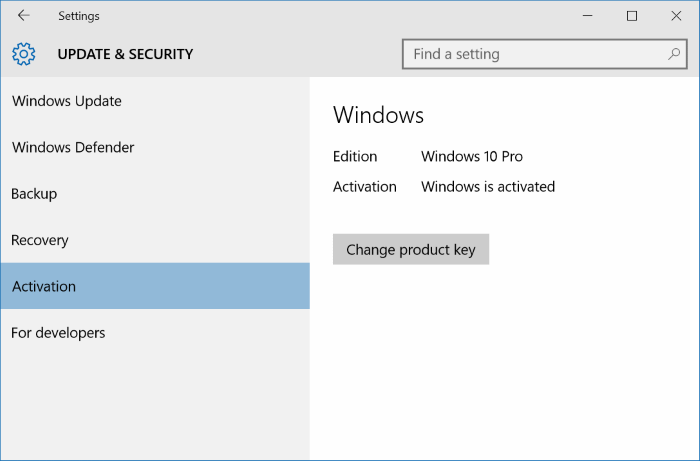 Step 4: Enter your Windows 7, 8 or 8.1 product key and then click Next button to activate your Windows 10. While clean installing Windows 10 from bootable USB, DVD or ISO, when are prompted to enter the product key, simply enter the genuine product key of Windows 7, Windows 8 or 8.1 to activate your copy of Windows 10. And if you can’t find your Windows 7/8.1 product key, please refer to our how to recover Windows 8/8.1 product key from BIOS and how to recover Windows 7 product key from registry guides. Our how to check the activation status of Windows 10 and how to check why your copy of Windows 10 was not activated guides might also help you.